Noel Clarke is without question one of the greatest forwards Tasmania has produced. A spectacular high mark and deadly left foot kick, Clarke gave great service to all four clubs he represented throughout his journeyman 14-season senior career. Born in 1930, Clarke’s football journey began with Campbell Town in the Midland Football Association, where such was the hype surrounding the teenager there was an active bidding war amongst a number of NTFA clubs in a bid to secure his services. Eventually it was North Launceston who landed the prized 18-year old, and Clarke lined up with the Robins for the 1949 season. North were in the midst of arguably their greatest-ever era, and Clarke was certainly no outsider during the period, playing in NTFA premierships in 1949 and 1950, and well as a State flag in ’50 and announcing himself as one of the most exciting young prospects in the country. As you’d expect the VFL had taken notice, and during the 1950-51 off-season Melbourne attempted to sign Clarke, however North Launceston staunchly refused to clear him, in a move some viewed as payback for the VFL refusing to clear South Melbourne star and 1949 Brownlow Medallist Ron Clegg to Tasmania the previous year. It took a great deal of wrangling but eventually Melbourne landed their man, and Clarke ran out for his first game with Melbourne in Round 6, 1951. Clarke’s first season with the Demons netted 25 goals in 13 games, including hauls of six in his final three matches. The following season would see Clarke cement himself at VFL level, topping Melbourne’s goalkicking with 49 goals, finishing fifth in the VFL. After the Demons’ struggles in 1953 forced Clarke to play a more defensive role, he was back to his best in 1954, this time booting 51 goals to finish third on the VFL goals table behind Footscray’s Jack Collins and Geelong’s Fred Flanagan. He then started 1955 well, booting 21 goals in his first nine games before succumbing to thigh, shoulder and back injuries, and it appeared his year was over. However he was sensationally recalled for the Grand Final at the expense of fellow Tasmanian Athol Webb, and proceeded to kick three goals against Collingwood in Melbourne’s first premiership of the Norm Smith era. Despite this success, Clarke returned to Tasmanian after the 1955 season, joining North Hobart in the TANFL. It soon became apparent that Tasmanian football had regained a terrific player, as Clarke collected a TANFL goalkicking award, two North Hobart goalkicking awards, a premiership and the medal for best TANFL representative player in his two seasons at North Hobart Oval. He was also selected to represent his state at the 1956 National Carnival in Perth, performing superbly with 14 goals to finish second behind Victoria’s Jock Spencer. In 1958 Clarke was appointed captain-coach of New Norfolk, and although he seriously injured his knee early in his first season with the Eagles he still produced enough brilliance in his two seasons at Boyer to be named in New Norfolk’s Greatest Team. 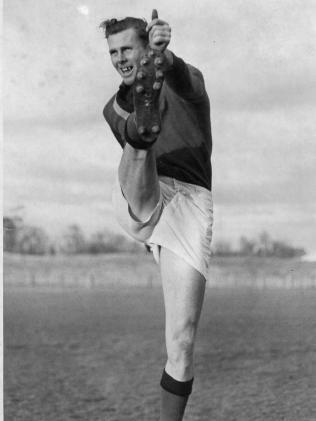 Returning to North Hobart in 1960, Clarke claimed a second TANFL goalkicking award and another two premierships before retiring at the end of 1962 after more than 200 senior games and 450 goals. The legacy he left in Tasmanian Football is such that he was named in the greatest teams of no less than three clubs: North Launceston, North Hobart and New Norfolk.